Cookie & Pretzel Ice Cream Cones: Crunchy cones made of cookies and pretzels! Don’t waste delicious ice cream on a basic cone. Cookie & Pretzel Ice Cream Cones complement the frozen dessert with flavors that’ll enhance your ice cream experience in new ways. 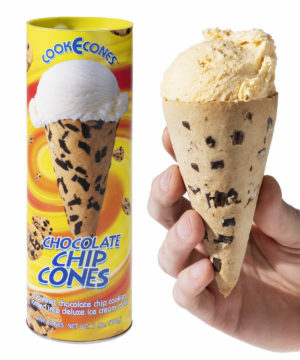 Cookie Cones let you double up on desserts with a cone made of crunchy, delicious chocolate chip cookies. Each bite is like a custom ice cream cookie sandwich made with your favorite flavor. 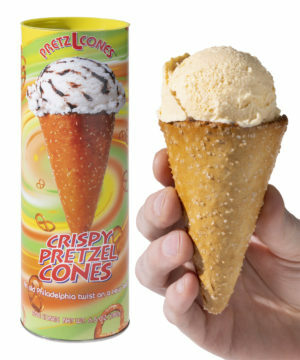 Pretzel Cones give you a hit of crispy, salty pretzel with each bite of your soft, sweet ice cream to make an unbelievably addictive combo. With five cones in each pack, you’ll have plenty of chances to figure out exactly what flavor of ice cream goes best with each cone (we completely understand if this requires extensive flavor testing).